Using the point vortex flow on a disc as a prototype, we present a closure for incompressible ideal fluid flow in the form of a generalized thermostating device. The thermostat can model either an infinite or finite reservoir. The thermostat variables are stochastically forced. Numerical experiments are in excellent agreement with the two-scale simulations of Bühler (Phys. Fluids, 2002). Note Supported by the Research Council for Earth and Life Sciences (ALW) with financial aid from the Netherlands Organization for Scientific Research (NWO). Dubinkina, S, Frank, J.E, & Leimkuhler, B.J. (2009). 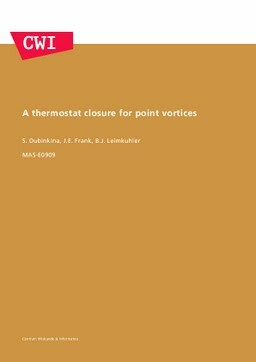 A thermostat closure for point vortices. Modelling, Analysis and Simulation [MAS]. CWI.